Thinking about a career change....? If you enjoy teaching others, learning from and working with a wide variety of horses, seeing results from your horse work, and meeting lots of interesting people along the way, then have you considered becoming a Monty Roberts Certified Instructor? Working with horses can be hugely rewarding. Despite popular belief, it is possible to earn a living in the field if you are careful about which area of the horse world you go into. By learning Monty's world famous non-violent horsemanship methods, you could find yourself traveling the world, working alongside professionals in the corporate training, personal development or mental health fields. Equine Guided Education is becoming increasingly popular and Monty's methods lend themselves well to this exciting new field. As one of just 10 Certified Monty Roberts Instructors in the U.K., I offer a selection of thought provoking hands-on courses. You can gain the Monty Roberts Introductory Certificate of Horsemanship by starting by completing the two week Introductory course and then adding this together with some of your own field work. This is a supported stage of learning that is included in the course fee. 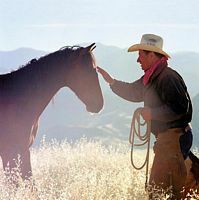 The completion of this courses gives you the possibility of becoming a Certified Monty Roberts Instructor. For a full list of Certified Monty Roberts Instructors click here. The introductory course is the first step to gaining an in-depth understanding of Monty's concepts. There are no prerequisites and students from a wide range of backgrounds take part. It is designed to provide you with an overview of the theory of horse performance, breeding, feeding and nutrition with a strong practical emphasis on horse psychology. You will learn Monty’s concepts through demonstrations, discussions, video, practical hands-on exercises and round pen work. As the foundation of Monty's work and a prerequisite for the Advanced Course in California, Flag is Up Farms, you will learn the method of Join-Up® as it relates to different environments. You will also have the opportunity of build your skills in the Dually halter work, long lining, herding exercises and loading. Following the course of hands-on experience as well as theories in horse psychology, you will return home to complete several months of field study (submitted via videotape every other month). This is your opportunity to practice with lots of different horses and really hone your skill set. We recommend at this stage that the horses you work with are already backed and trained. You do not necessarily need your own horses for this stage in your learning. In fact, not having your own can actually be quite helpful in that you will gain exposure to lots of different 'horsenalities'. Every horse has something to teach us so this can only be beneficial. Following successful completion of your field study, you will be invited back to complete practical and written exams, at the successful completion of which you will graduate with the Introductory Certificate of Monty Roberts Horsemanship. When: 12th - 16th June & 19th - 23rd June 2019. Please note, I also run these courses for individuals throughout the year, please get in touch if you are interested in this option. To Book Now: To book this course, please complete the application form with your chosen payment method and return to laira@lairagold.com or send to The Office, 2 Steane Grounds, Steane, Northants, NN13 5LG. You can also pay via paypal. To secure your booking a £200 deposit is required. Cost: £995 per person. Price includes several months of supported field study. Fee can be split into monthly payments - please enquire for details. These two days are designed to introduce those of you who have little or no experience with horses to some of our gentle equine companions. Perhaps your spouse or your child has a horse and you are interested in familiarising yourself more with these magnificent creatures. 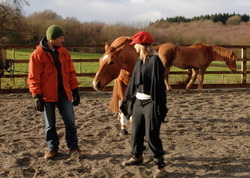 Or perhaps you are interested in getting back into horses having been away from them for some time. This is a wonderful opportunity for all of you who would like to familiarize yourselves with horses while spending time in the beautiful Buckingham countryside. Learning to approach a horse safely, becoming comfortable around horses in the field and in the stable, as well as learning how to groom and tack-up properly. You will be introduced to working with the Dually™ halter to learn ways to apply Monty’s force-free training concepts on the ground while learning how to lead a horse correctly. You will have the opportunity to watch a Join-Up® session conducted by Laira Gold, Certified Monty Roberts Instructor, and see for yourself how important it is to become acquainted with the basics of horsemanship. This is an excellent chance to become more comfortable around horses prior to signing-up for one of our Join-Up® courses or the Monty Roberts Introductory Training Program. Courses: run from 9.30am to 5pm and are held in Buckinghamshire within easy reach of Bicester North Train Station. Just as we do with the horses, our aim is to set you up to succeed. Therefore, we provide a day of review work where we have an opportunity to revisit any previous development areas, followed by two days of practical and theoretical exams. Graduates from the Introductory Course are offered the opportunity to continue their education by completing the Advanced Course at Flag is Up Farm, California. Upon personal selection by Monty, the Instructors' Internship may also be offered. Only Certified Instructors are able to teach, demonstrate and advertise their services for monetary gain. To Book Now: To book this course, please complete the application form with your chosen payment method and return to equilibrium@lairagold.com or send to The Office, 2 Steane Grounds, Steane, Northants, NN13 5LG. Paypal is the easiest way to secure your place on this course. Variety of horses - A variety of horses are on the course with a wide range of personalities for you to learn from. Some are quiet and sensitive, others are stronger. Each will teach you a valuable lesson. You do not need your own horses for any part of the process. What do others say about Laira's courses? "I have no other words than life changing!! I left writing my review until I had been home for the week to reveal the full impact that the course has had on my life working around horses. I am part of a working stud farm and have done everything from horse racing to show riding but this course was a complete eye opener and I will never be the same again in my horsemanship, 20 odd years of traditional techniques went out the window in 1 course! What Laira teaches with the Monty Roberts Methods are crucial for building relationships with your horses and finding that level of harmony between horse and human. Laira is a superb teacher making things easy to understand and giving the perfect amount of theory and practical teaching. Since being home even the smallest detail that Laira taught has made a MASSIVE change in the way the horse responds to me and the Monty methods have certainly shone a light on a lot of things. I could write a whole essay on why people should do the Introductory course but all I can say it is one of the best lessons I have learn't and I recommend it for anyone, from the leisure rider and horse owner to professionals.